If you’ve read about my obsession with Minced Pork & Fresh Oyster Congee right now, it won’t come as a surprise that I went to the Congee Noodle House for lunch again today. My lunch partner of the day was a co-worker who’s food fancies are similar to mine. 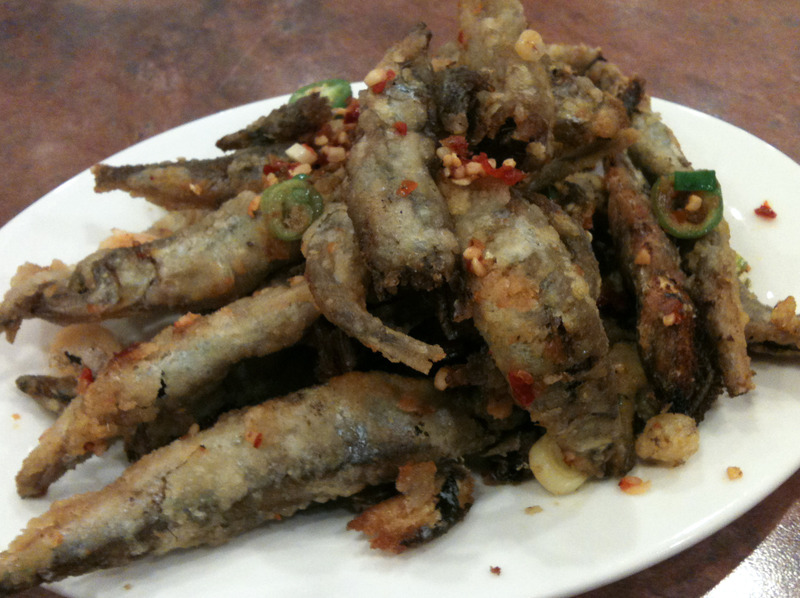 So it’s only when I dine with my co-worker that I can order deep fried smelts with salt and chiles. I love these little fried fish. They have a crispy coating on the outside , and a sensational hit of salt, garlic and spiciness from the red chiles and jalapenos. If you’ve never had smelts before, you may be surprised that most of the little fishys have a sack of eggs on the inside, which in my mind is a bonus, although you may not agree. If you haven’t tried these before, they’re worth a try. Let me know if you go, I’m always looking for a partner to eat them with! the year was ’69 when somewhere near the original and oh so funky gastown i had my first fried smelts chosen solely because i could buy the batch for the loose change on my pocket and still have enough to buy a watermelon. ate both on the stoop of the building next door. best meal i ever had.